Download a track for free! Brit drummer Mark Heaney has just released his second solo album, Origins, the follow up to the fantastic Drum Room. Mark recorded the whole thing himself using a stripped back set-up. The result is an intricate, groove-based long player, with a focus on old-school dance beats and breaks. We caught up with Mark to find out more about the concept of the album. If you want to hear more you can download a free track - River of Golden Radiation - at the link below. "I wanted to make an album which reflected my musical beginnings and represents the origins of my sound and style. A mixture of various sounds and music that inspired and made me the musician I am today." To capture a genuine, organic room sound and raw energy, Mark used only one microphone on most of the tracks (for some he stretched it to two or three). "I wanted to avoid the close mic over-compressed, over-produced scenario on this recording. You can really hear a player's sound and expression when it's stripped down to one mic and very little effects like you're stood in the room with the drummer. "Most tracks were done in one or two takes. For me this album is all about the performance, energy, emotion, excitement, and the unpredictability of improvising in the moment which to me is the essence of being a musician. I always try to make music that reflects life experience and emotion." To play the track River Of Golden Radiation click here (or right click and Save As to download). "This track started as most of my tracks do from a loop. I have a huge library full of loops created over the years from my own drums and other sources and I will usually play to them to create in the moment the idea of what the track will become. I wanted this track to really heavily feature the drums with the backing being pretty sparse with an extended solo to which I added a flanger as it suited the vibe of the track. 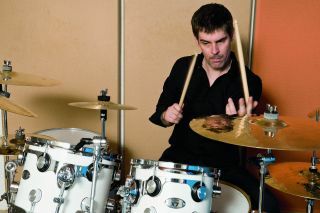 "Usually with solos I find them more interesting when the solo is played against a groove. So with this solo I cut a section of groove from the first section, looped it up, panned it left and played against it which is something I do a lot of, especially on this album. Once I had the basic framework for the track I went for two takes on one mic and that was it. Pick the best and it's done." The album is available to buy now from Bandcamp.